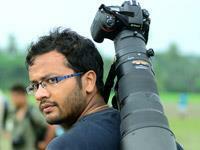 Vivek Prasad- started out as a hobbyist but soon photography grew on him, hails from the Queen of Hills, Darjeeling. Learning and experimenting by himself, he joined National Academy of Photography, for better technical guidance. A versatile photographer who loves to shoot whatever strikes his eyes, but loves Landscapes and Candid Portraits the most. • His series of work has been appeared in State Lalit-Kala Academy, Uttar Pradesh. • His different works has been exhibited in different countries USA, Malaysia, Sweden, Ireland, etc. • His work has been exhibited at Nandan (Kolkata) since 2010. • Recently his photo was exhibited at ALIVE a National Level Art & Photography exhibition held at New Delhi. • One of his photo is featured in Samsung mobile wallpaper. • Because he is keen on sharing his skills, he conducts workshops on photography for professionals as well as beginners.